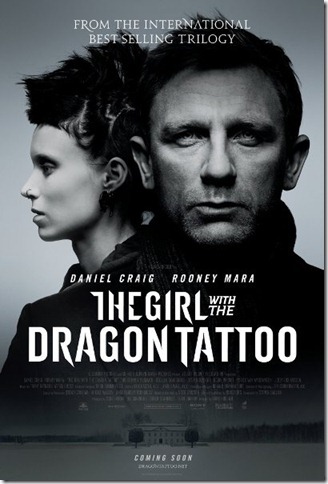 The Girl With The Dragon Tattoo: What is hidden in snow, comes forth in the thaw. A murder mystery that has a man being taunted by the killer when he receives a package every year on the anniversary of the dead girls birthday. He seeks the help of a disgraced journalist Mikail Blomkvist (Daniel Craig). As Blomkvist digs deeper into the mystery he is convinced he needs an assistant so he is introduced to Lisabeth Salander (Rooney Mara), who agrees to help Blomkvist as they uncover more clues the tension mounts and the action picks up. Excellent movie that I watched twice the first week after I bought it. I have seen the Swedish trilogy and I know that many people will disagree with me but I like this version better. David Fincher weaves the tale masterfully and keeps the audience on the edge of their seat. Great performances by all the actors this movie deserves more credit. If you liked this try: Fargo, Jagged Edge, Michael Clayton.